You have read incident of famine in Egypt in Surah Yousaf of 12th para of Holy Quran that King of Egypt (that had put Hazrat Yousaf A.S in prison) dreamt that there are seven fat cows eaten by seven weak and thin cows. And seven ears of wheat green and seven ears of wheat dried up. So Hazrat Yousaf was called to interpret the dream. Hazrat Yousaf said for seven consecutive years you will yield crops so leave whatever is surplus in their ears, then seven hard years of famine will come and the food stored in previous seven years will be eaten up. Hazrat Yousaf requested the King that he should be made minister of treasure as he knows how to manage and protect it. Here Allah says, “In this way we gave Hazrat Yousaf respect in Egypt and I (Allah) bless pious people in this way and their reward is not wasted in My records. And the reward in the life afterwards is much better for those people who believe and did good deeds”. Through these verses of Holy Quran it is revealed that according to the dream of the King of Egypt whole area come under famine, but due to better management and policy of Hazrat Yousaf not only the Egypt but the nearby countries were saved from destruction of famine. Through this Allah shows us that it is possible to avoid negative aspects of fate by better planning. But the condition is that the management machinery should be honest and loyal. Now whole country has been destroyed by floods. Rivers flowing from Peshawar to Thatta have broken all the records of destruction in past. According to experts about 400 years ago such floods were recorded but at that time nor did we have latest devices to forecast upcoming rains neither the resources to minimize the impact of these floods. But now days everything is present. Meteorological department have been issuing warning since six months age that heavy rains are expected but imosed Rulers to us gave no importance to this warning. Before that these rivers have been cause of floods but we have never done any planning to tackle such floods. Young generation raises the question after seeing the flood banks around cities that have there been floods in the past? Then whether these flood safety banks fall in the planning mentioned above which has been ordered by Almighty Allah. These are those banks in whose names yearly millions of rupees are wasted by the corrupt machinery. Are our rulers unaware that the banks made by their liked and corrupt contractors are not trustworthy? Four decades before same situation was in China that when rivers got flood many people died. Chinese nation could not stop the raining water from skies but they decided to change the fate through planning. Whole nation joined together dig the rivers and make the banks of rivers higher and strong. Along with these they planned to make a new dam every two years. Now when clouds thunder hearts of Chinese don’t get frightened. 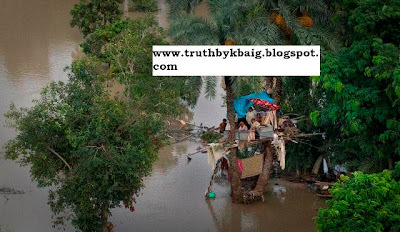 Unusual rain falls still happen there but life loss does not go beyond two digits and financial loss is also minimum. The reason is that there construction plans are not used for filling up the coffers with illegal money but to secure the future of upcoming generations. However if still any type of corruption is noticed the culprit gets the death punishment on the spot and his usable limbs are donated to near by hospital. On the contrary in our country there is no incident of punishing such people which can be given as example. Whole nation is being punished for not punishing the thieves, fraudsters and corrupt officials. Dishonesty of our rulers has defamed us in the whole world. It is clear the greater the fraudster more respected he is here. the greatest fraudulent person is present in the govt. neither he listens to the law nor accepts the moral values. During the last mid century that mafia has grown to a strong group of the society. They have their own rules to spend the life that circulate around one point i.e. “Loot and get lost”. Their dress, their glasses, their style of life everything is different from 95% of Pakistani nation. That Pakistan whose founder Quaid-e-Azam considered crime to buy socks from the national treasury, from that our rulers goes to Hajj and Umrah annually. They have enslaved nation in spite of freedom. They have divided in several disputes nation to strengthen their govt. In 1947 when Pakistan got freedom there was no Punjabi, Seraiki, Baloch or Pathan but Urdu was joint identity and voice of everyone. Everyone was just Pakistani. 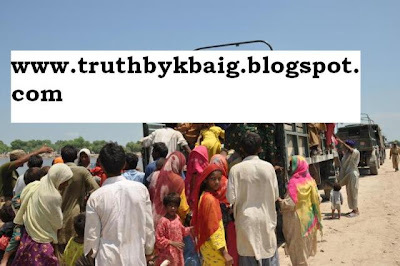 Look at the situation in Southern Punjab, majority of the Public Representatives selected from here when migrated here the locals of the area welcomed them. Now where is that passion of sacrifice? People are immigrants with in their own country. Their homes, livelihood every thing has been engulfed by water. Some years before when earthquake hit the northern parts of country whole country ran to help the victims. 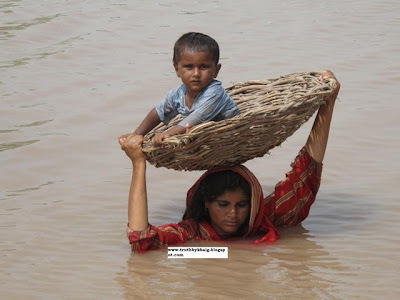 Now what happened, Pakistan is drowning, estates of Pakistanis are being destroyed by flood but there is shortage of aid donors. Foreign countries are not ready to donate relief goods, not ready to provide with aid in the form of cash. Under the umbrella of natural disaster provincial disputes are being promoted. Inhabitants of Khyber P.K. say they have to bear a greater loss, millions are being demanded from Federal govt., Balochistan is complaining of no response, Sindhi are saying that in order to save the estates of landlords their houses have been drowned. Southern Punjab is complaining that Chief Minister is touring the affected areas but they are not giving them any relief. Rich people (Pakistani and other) of foreign countries are worried to help but they do not trust our rulers. The harsh fact is that even Secretary General of United Nations has to say that “credibility of Pakistan id hurdle in getting aid from international community”. Now there are only two organizations who are restless in fulfilling their duties; one is media, its photographers, reporters, anchorpersons are trying keep the world abreast with the situation in flood hit areas in spite extreme hot, are motivating people to help victims. This is the result of the struggles of electronic and print media that whole world is coming in motion to help the flood victims. Verily people of our media deserve appreciation. The second one is army, whose personnel including Generals to Soldiers are present to help the flood victims 24 hours a day. They are fulfilling this duty like a war. They have forgotten to take food, and are not wasting time for rest. 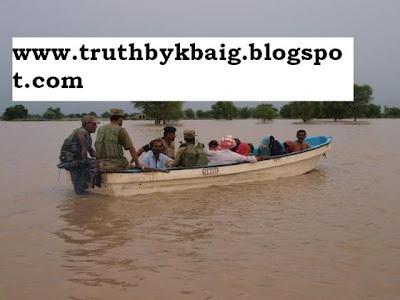 As soon as they get the report of helpless stranded people in flood they take up helicopters, speed boats or what ever means that can be used to reach there and evacuate them. You even do not see any sign of restlessness or harshness over their faces. They are so much fulfilled with the passion for sacrifice that most often the soldiers give their food to flood victims and half of the reserved food/ration has been donated to victims flood. 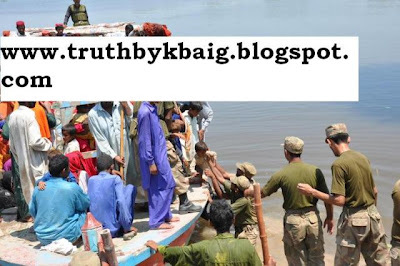 Only under the supervision of Army in Multan daily 100,000 people are provided with food. And army aviation is creating new history by operating even in bad weather continuously to evacuate people stranded over roofs of their houses, Dates trees etc. to safe places. This process is still going on. 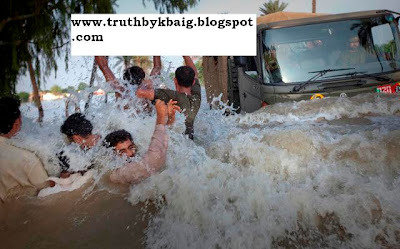 Being witness of such a evacuation operation the reporter of Gulf News that these soldiers are not human beings but angels. He is astonished that how a soldier held the hook of helicopter in one hand and with other hand he helped to 13 other healthy men and women to board the helicopter, where other soldiers were standing ready to pull them in. during whole this activity the Rooter of helicopter was rotating with full speed. When the question is of saving our own people than arms get powerful and our army is going through war since 2005. army is busy in fighting such a war against terrorism where it has to find the enemy within own people and it is not known that when and from which side enemy will attack. Our army is not worried of this war. 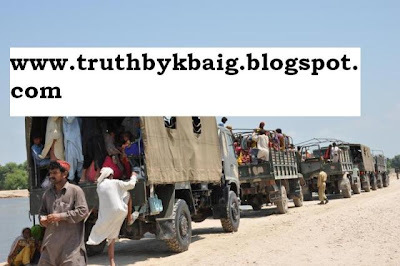 How our army transferred the whole population from Swat n Malaknd and restored peace there you cannot find even a single example of such professionalism and sacrifice in the history. Contrary to this in the relief work they have to evacuate our own people to safe places. They have to be taken care of their health and food. 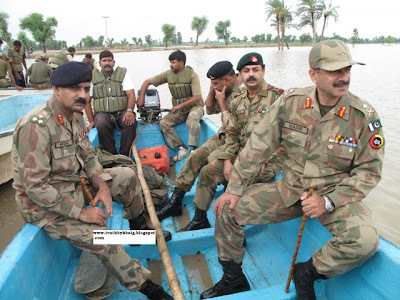 They have to be provided with a helping hand and our army does this in every natural calamity/disaster. But this is not important, evacuating the victims is not the only problem, problems are more than that but our army has not resources to fulfill this requirement.